Active seniors want a wheelchair that will excel in any situation, whether they’re just looking to get around the house quickly or to travel outside the country in their chair. This type of versatility requires a chair that’s well built and will perform well in many different circumstances. We’re taking a look at six of the best heavy-duty electric wheelchairs on the market today. This chair folds and unfolds easily and operates well on all sorts of terrain. 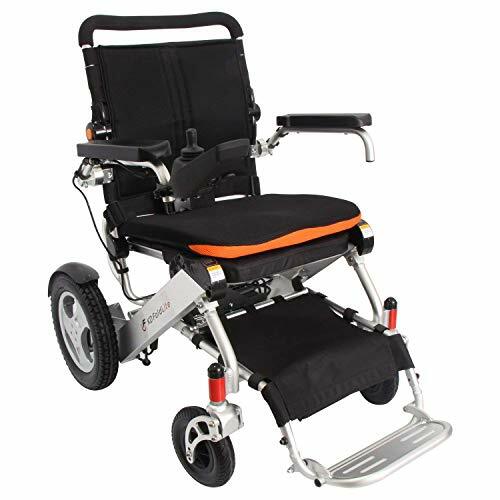 This foldable heavy duty wheelchair combines comfort with functionality. It has an adjustable backrest that can help you stay comfortable no matter what your preferences are. This feature may also benefit people who spend the majority of their time in the wheelchair; it allows you to change positions to prevent getting sore or stiff. The suspension on this wheelchair is also a major bonus because it absorbs the shock from uneven roads well. You’ll hardly notice holes or uneven surfaces. On of our favorite elements of this wheelchair is how easy it is to fold and unfold, which is an unexpected bonus given its large size. One person can easily fold and unfold this chair in less than a minute, which means it’s easier to store and transport for seniors who like to travel. With a variety of settings and battery operations, you can run this chair for a long time between charges. We chose the Foldawheel because of its incredible battery life and usability on any terrain. This chair moves through deep grass, gravel, and even snow with no problem. The wheelchair’s two batteries do make it quite heavy, but they enable it to run for 18.5 miles through any terrain. Seniors can fold and unfold this chair within a few seconds requiring only one person with no assitance, making it a great choice for independent older adults. The construction of the chair is sturdy and the design is thoughtful. We have no fear that this chair will last well beyond its two-year manufacturer warranty. This lightweight chair loads and unloads easily because of its simple fold up functionality. This lightweight chair stands out for its large, all-terrain wheels. The 12 inch rear wheels are designed for rough and uneven terrain. While they also work well inside, they may damage carpets and soft flooring if used frequently. This chair weighs 64 pounds with the battery, making it one of the heavier options, but it may be worth it for older adults who appreciate getting over ten miles on one charge. Another thing we liked about this chair was how it sits; it is much easier to get in and out of than other chairs and comes with a soft seat cushion. This chair also folds and unfolds easily with little effort. 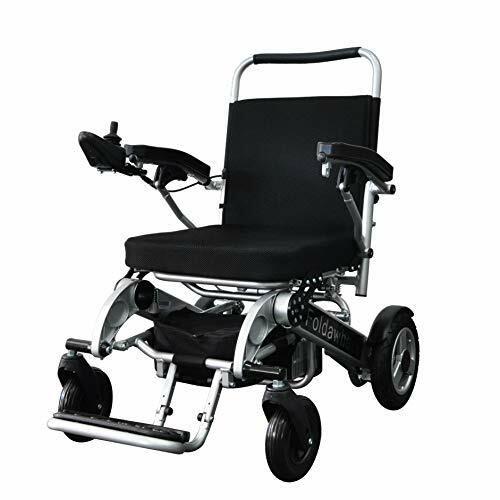 This front wheel drive electric wheelchair offers an array of great features. It’s comfortable to sit in, features plush padding on the seat and the armrest, and can be disassembled quickly, which makes it easy to travel with. The Trident has large 14-inch wheels on the front which create excellent traction and control when driving across uneven surfaces. These tires also work well on surfaces like gravel and packed dirt. We appreciated that some of the extra features on this model, like the footplate and bumper, are removable, making it more streamlined for indoor use. The one drawback of this chair is with the controls. The control is not user-friendly or intuitive and takes a lot of getting used to. The brakes are also highly sensitive, which could make for a jerky ride for seniors, especially if they suffer from arthritis or other conditions that are easy to aggravate. This chair is as good as it gets. With the Jazzy you get extreme durability and stability to prevent accidents and tipping. In our opinion, it doesn’t get better than the Jazzy 1450. While it does come with a hefty price tag, this model boasts many impressive features and benefits. It’s a great option for seniors who want it all and don’t mind paying for it. This chair navigates well on any terrain, thanks to the company’s swingarm suspension. It’s also easy to navigate, navigating sharp corners and accidental drops easily. You can relax knowing that you’re highly unlikely to tip in this sturdy chair. Each person has a unique issue that they are looking to alleviate, and a wheelchair can help with it. Everyone prefers something different when it comes to wheelchairs, and most seniors have their specific needs in mind when they begin their search Luckily for them, wheelchairs are continuing to evolve and offer new features to help meet those needs. We’re going to take a look at some of these next. One of the most important things to look for in a wheelchair is comfort. If it doesn’t feel good when you sit down, or it doesn’t feel nice after a few hours, then you wouldn’t want that chair for long-term use. While some seniors modify their chairs with additional cushions or some form of padding, ideally your wheelchair will offer all the comfort features you need. Pay attention to where the location and volume of the padding. If the arms, back, and seat have an ample amount of padding, give them a feel. Does the padding rise back up after pushing on it, or does it seem to wear down quickly? Another main factor that affects comfort is the adjustability of the chair. Not everyone is the same height and weight, so each chair needs to be flexible to meet the needs of a variety of different sizes. Do the arms adjust? Does the back have a variety of reclining settings? Is their a footrest and is it adjustable? Is the overall seat height of the chair flexible to meet the needs of older adults who are taller or shorter than average? These are all crucial factors that can determine your daily level of comfort while using the chair. You need a chair you feel confident traveling in, and if it seems fragile or wobbly, it’s best to avoid that chair. 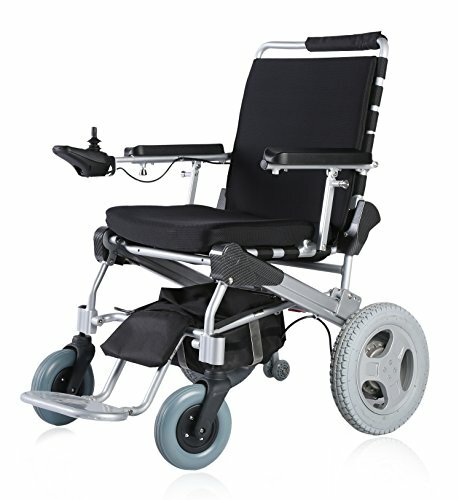 What types of tires does the chair have and do they appear to travel well on all kinds of terrain? Another thing to pay attention to is a chair’s overall durability. You certainly don’t want to encounter any electrical or mobility issues that could leave you stranded. Stability is another important factor. If you intend to use your chair for outdoor travel, you want something that has a self-stability feature that prevents tipping in case you accidentally drop off a curb or ledge. These features are essential for your safety. Navigation is not always easy to test before you buy, so we recommend you read reviews from other users. Some chairs ride smoothly and navigate easily on all terrain, while others simply do not. If you plan on using the chair outdoors, you want a chair that works well for indoor/outdoor use. Take a look at the joystick and the controls of the chair you’re considering. Some chairs tend to jump and jolt rather than smoothly accelerate or brake. If you have arthritis of some form of joint pain, a rough ride could be a major deal breaker. Some chairs also come with a unique suspension that absorbs much of the shock you experience while riding around, but others do not. This is also something you’ll want to consider when picking a chair. If you want to be comfortable in your chair, you need to make sure the chair is large enough to sit in comfortably, even for extended periods of time. In addition to overall capacity, every chair has slight variations in seat and backrest size, so you want to pay close attention when choosing the right chair for your size. Some chairs also come with a higher backrest than others, so you’ll definitely want to take this into consideration. Also, make sure you check the chair’s overall weight capacity. Most of these heavy-duty wheelchairs can carry a wide range of body types, but it’s always worth double checking before making your purchase.